Speleological expedition "Lukina jama 2010"
Text: Luka Mudronja, Dalibor Paar and Marko Lukić. Translated by Dina Kovač. Speleological expedition „Lukina jama 2010“ was held between 24th of July and 15th of August 2010. It was organized by Speleological section Velebit and the Speleological Committee of the Croatian Mountaineering Association in cooperation with Northern Velebit National Park, with logistic support of The Croatian Mountain Rescue Service (CMRS). Around hundred of speleologists from 14 Croatian speleological clubs and associations participated in the expedition as well as colleagues from Bulgaria, England, Slovakia, Czech Republic and Spain. This was one of this year’s most challenging expeditions in Europe given the logistics and large amounts of equipment transported to the bottom of the pit in conditions of low temperature and significant water activity. 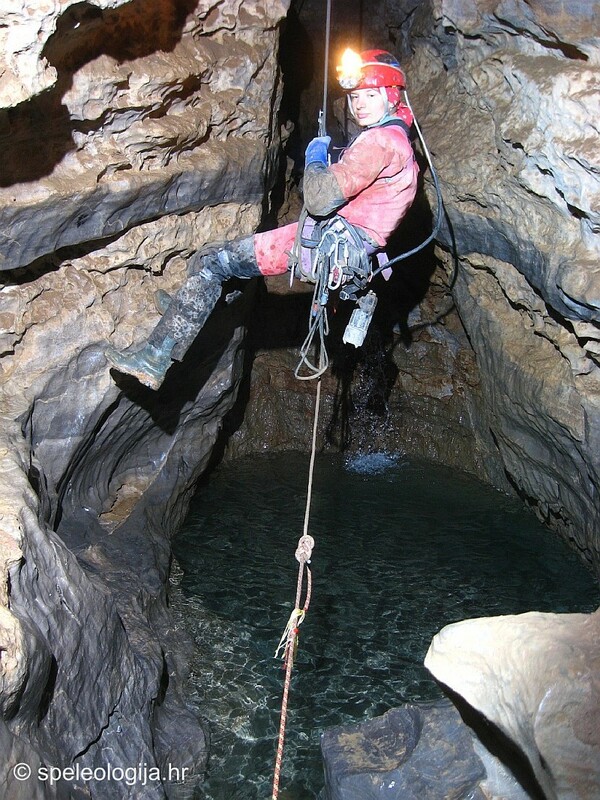 The expedition resulted in cave diving in the lake at the bottom of the pit, in new speleological topographical maps and scientific research which includes studies of the subterranean fauna, hydrogeology, physical, chemical properties and other characteristics of the pit. Cave divers and members of the Speleological section Velebit as well as CMRS, Ivica Ćukušić and Robert Erhardt, dived into the submerged passage at the bottom of the dry part of the pit for 135 m in length and 21 m in depth, increasing the overall cave depth to 1400 m and more. 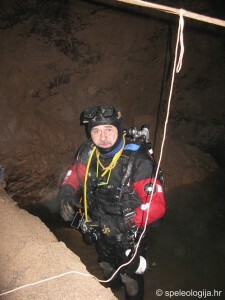 During the expedition, well known Croatian cave diver and member of Speleological section of HPD Željezničar as well as Croatian Biospeleological Society (CBSS), Branko Jalžić, dived into the submerged passage at the bottom of the pit at 40 m in depth. New overall cave depth is now 1421 m, which makes it the 15th deepest cave in the world. 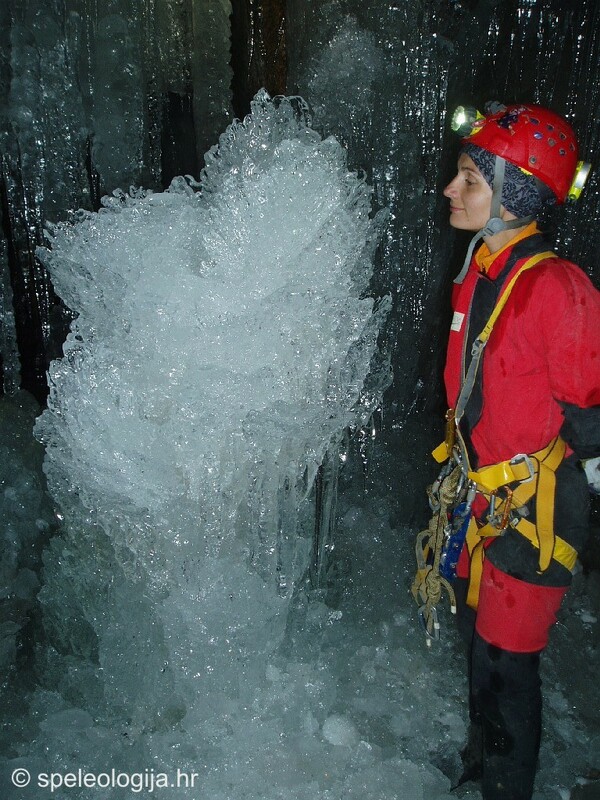 Croatia has number of extremely vertical caves and pits, which require multi-year research in form of expeditions. Lukina jama is situated in the area of Hajdučki kukovi in Northern Velebit National Park and it is the deepest Croatian cave from 1993 until today. Its depth was increased during this expedition to -1241 m, which, according to data from October 2010, makes it the 15th deepest cave in the world. Although the widely accepted name is Lukina jama, this is actually a cave system Lukina jama-Trojama. This year the entrance was closed with snow and ice at a depth of around 70 m. This condition, which is not consistent with the trends of global warming, has been going on for years, unlike to the nineties period from the last century, when the entrance was passable. The second 37 m higher Trojama entrance (located at 1475 m altitude) was passable, so this year's expedition took place through it. Speleological expedition “Lukina jama 2010” had several goals: speleological research, especially cave diving in the siphon-lake at the bottom of the pit, new topographic speleological maps and scientific research which includes studies of the subterranean fauna, hydrogeology, physical, chemical properties and other characteristics of the pit. Some measurements were conducted during the expedition, while part of them will be taken during the following year by setting up monitoring devices for hydrological, microclimate and other parameters (on the right photo: water flow in Lukina jama at around -1200 m in depth, photo by A. Bakšić). Deep pits of Velebit provide excellent way of gathering new insights on the geology of Velebit, hydrology of karst underground and on natural wealth such as the endemic subterranean fauna. Therefore, the aim of scientific research is to gather as much information on the properties and characteristics of deep pits. 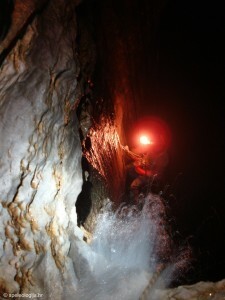 Speleological research of deep pits requires a teamwork of a number of excellent trained speleologists, since the complex conditions require a good knowledge of speleological techniques, from techniques on movement through the underground and organizing underground expeditions to speleological topographic mapping (precision according to the criteria of the International Union of Speleology: UISv1 5-4-BCF). Speleological research in the speleological expedition “Lukina jama 2010” was conducted under the leadership of Luka Mudronja by around hundred of cavers from 14 Croatian speleological clubs and associations and in cooperation with the colleagues from Bulgaria, England, Slovakia, Czech Republic and Spain. 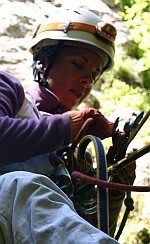 Each participant gave a valuable contribution to the expedition through various activities, including setting up the pit for further movement and research, demanding equipment transport for cave diving research, cave diving in the lake / siphon at a depth of 1368 m, speleological topographical mapping, production of photo and video documentation, assistance in the scientific research of the pit as well as logistic support at the ground surface. A part of every expedition is a detailed survey of the field, exploring new entrances to the cave as well as possible new perspectives in a new found speleological object. The focus of this year's expedition was directed to the bottom of the pit, where it was attempted to determine whether lake/siphon at the bottom of the dry part of the pit at 1368 m depth represents a hanging siphon or part of karstic aquifer. 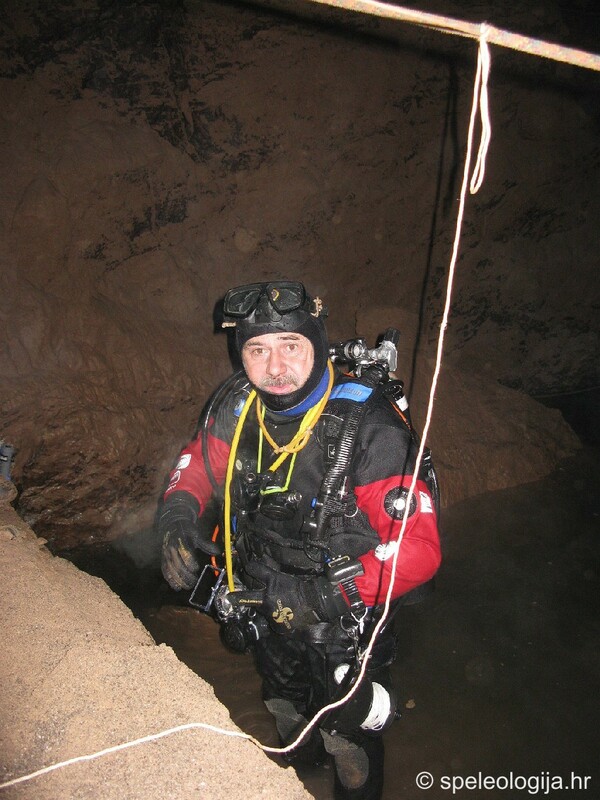 The only dive in that siphone was conducted by cave divers Zoran Stipetić-Patak and Teo Barišić in 1994. They dived 57 m in length and 6 m in depth which was the deepest cave dive in the world. With the first dive at this year's expedition, Ivica Ćukušić and Robert Erhardt dived into the submerged passage of 135 m in length and 21 m in depth, which increased the overall cave depth to over 1400 m. With the second dive, Branko Jalžić reached 40 m in depth where he stopped in a vertical passage which continues to go down. Jalžić stopped at the 54 m altitude and given the cave morphology, there is a possibility to reach the sea level in future research. These results suggest that the level of the lake at the bottom of the dry part of the pit corresponds to the level of the karst aquifer and therefore the level of ground waters in this part of Velebit’s underground. This great depth of the karst aquifer is expected due to the karst properties of dissolution porosity, typical for soluble carbonate rocks. The main objective of physical, chemical and hydrogeological research in the pit was gathering information on the properties and dynamics of water and air. Special emphasis was put on water chemistry analysis, as well as on microclimate parameters, radioactive radon and carbon dioxide concentrations measurements. The air temperature in the pit ranges from 0 °C in the upper part of the cave where permanent snow and ice are noted, to 5 °C at a depth of 1368 m next to lake/siphon. 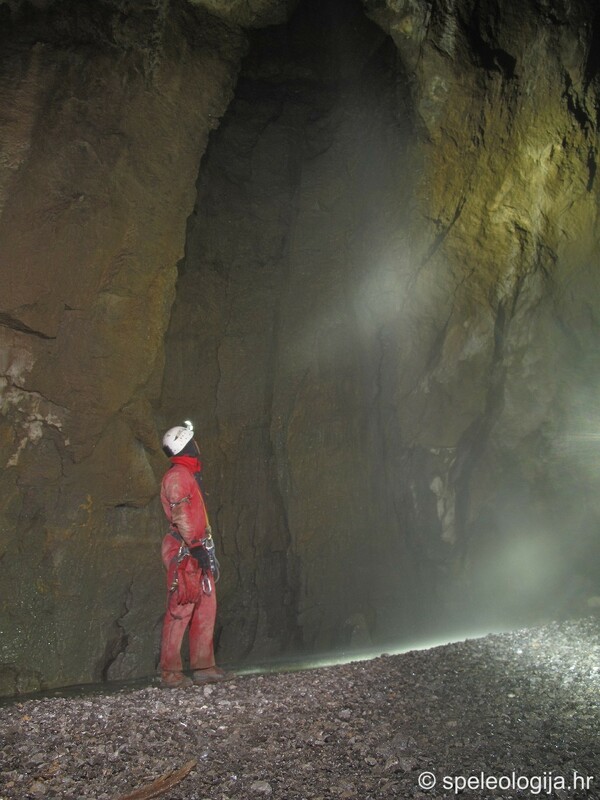 The cave is characterized by vertical dynamics of water up to the point of where it reaches the lake, and the water temperature in the upper part of the pit is extremely low. For instance, at a depth of around 300 m, the water temperature is only 0.6 oC. In the lake at the bottom of the pit, the water temperature is almost the same as the air temperature, slightly below 5 °C. The measured concentration of carbon dioxide is relatively low through the entire pit, considerably lower than in some other speleological objects in Croatia, where the measured values were more than ten times higher. Studies have shown that the air flow in the pit depends significantly on the changes in the climate conditions at the ground surface and in the water dynamics in the pit. By measuring the parameters, the correlation between the dynamics of water, the air flow and the water and air temperature was established. One of the aims of the research is to determine the origin and dynamics of water in the underground, and the meteor water contribution and dynamics transport to ground waters of karst aquifer. This processes are responsible for restoring water in the karst aquifer. By placing the appropriate measuring instruments, the water level wil be monitored in the lake at -1368 m and in the area at -980 m.
Andrej Stroj (Croatian Geological Survey), Vanja Radolić (Department of Physics, University of Osijek), Nenad Buzjak (Department of Geography, Faculty of Science in Zagreb), Magdalena Ujević Bošnjak (Croatian National Institute of Public Health), Darko Bakšić (Faculty of Forestry, Zagreb), Damir Lacković (Croatian Natural History Museum) and Dalibor Paar (Department of Physics, Faculty of Science, Zagreb) participated in the research. 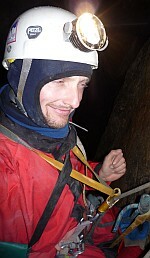 Biospeleological research in Lukina jama was conducted by members of the CBSS: Marko Lukić, Jana Bedek and Branko Jalžić. 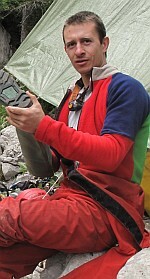 Ruđer Novak collected samples for microbiological testing. Thanks to a long research period of six days spent in the cave, new and rare cave species were recorded, primarily terrestrial isopods (Isopoda terrestria) and springtails (Collembola). Specimens of terrestrial isopods were noted in specific habitat, and therefore probably represent first specimens with special adaptations for living and feeding on a cave hygropetric and wet rocks. Five different species of springtails were recorded, including one new species and probably one new genus. Among other things, an arachnid was found (Palipgrada group) which is the first record of this group in the fauna of the deep pits of North Velebit. 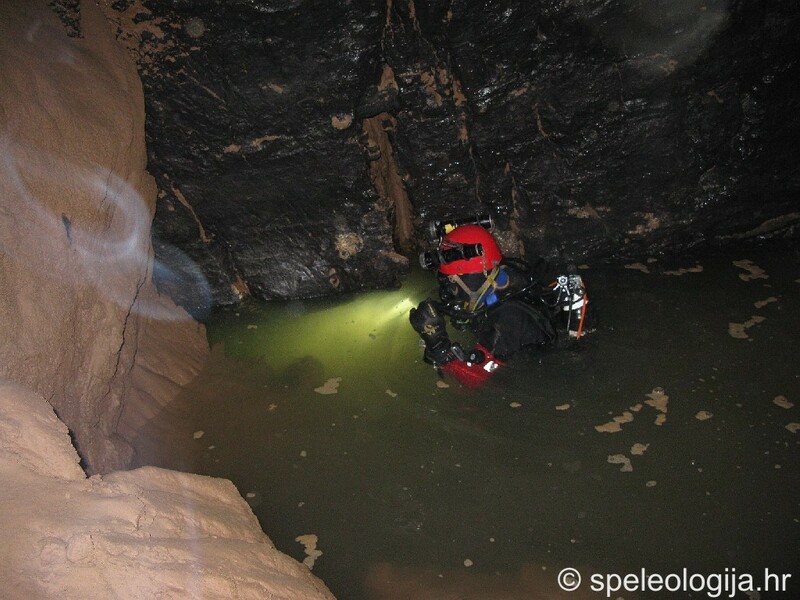 During the cave diving explorations at depths between 1368 and 1421 m, aquatic cave fauna was also studied. Critically endangered cave-dwelling bivalve Congeria kusceri, tube worm Marifugia cavatica and an underground cave sponge waiting for further analysis were found. Rich cave fauna was sampled in a small number of specimens due to specific habitat conditions and size of populations that inhabit certain micro localities. Collected biological material is being further analysed by the experts on different groups of invertebrates. 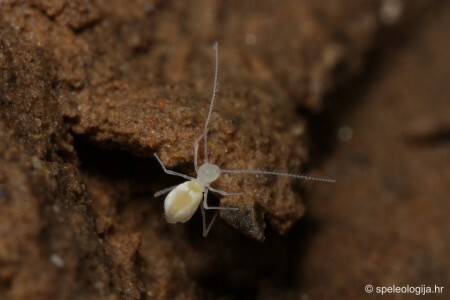 Given the small number of collected specimens collected before the description of new species and genera, further studies are required in the cave, as well as collecting additional material for morphological and DNA analysis. 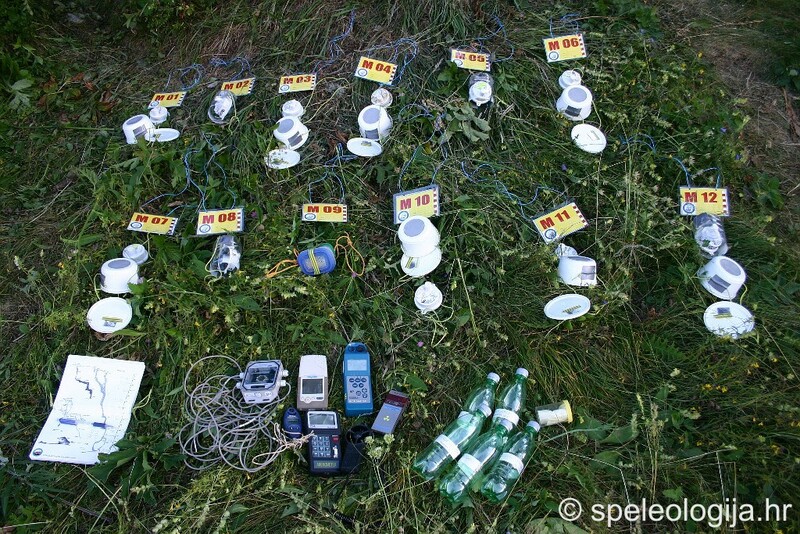 Bajo, P., Stroj, A., Paar, D., Ujević, M., Bakšić, D., Lacković, D., Čop, A., Radolić, V. (2009): Results of exploring the Munižaba cave (Velebit, Croatia) with special reference to measurements of physico-chemical and microclimatic parameters /17th International Karstological School "Classical Karst". Gabrovšek, F., Mihevc, A. (ur.). Postojna. IZRK ZRC SAZU, 51. Bakšić, D. i sur. (2002): Inventarizacija speleoloških objekata Nacionalnog parka Sjeverni Velebit (I faza), izvješće, SO PDS Velebit, 85. 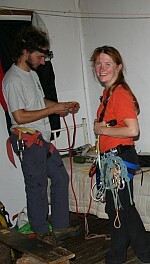 Bakšić, D. & Paar, D., (2006): Croatia and the Deep Caves of Northern Velebit. Alpine Karst, vol 2., ed. J. & T. Oliphant, 105-124, Cave books, Dayton, USA. Bradić, K.; Hadeljan, A.; Bajo, P.; Paar, D. (2010): The role of speleological explorations in cave protection in Dinaric karst (Croatia) // 18th International Karstological School "Classical Karst" - Dinaric Karst / Mihevc, A. ; Prelovšek, M. ; Zupan Hajna, N. (ur.). Postojna : Karst Research Institute, Scientific Research Centre of the Slovenian Academy of Sciences and Arts, 2010. 22-22. Buzjak, Nenad; Paar, Dalibor (2009): Recent cave microclimate research in Croatia. 17th International Karstological School "Classical Karst" Abstracts / Gabrovšek, Franci ; Mihevc, Andrej (ur.). Postojna : IZRK ZRC SAZU, 53-53. Buzjak, N.; Paar, D.; Bakšić, D. (2010): Some characteristics of ice and snow caves in Croatia // 4th International Workshop on Ice Caves. Abstract Volume / Spötl, Christoph ; Lütscher, Marc ; Rittig, Patricia (ur.). Wien, 2010. 8-9. Kuhta, M. i sur. (2002): Inventarizacija speleoleoških objekata na području Nacionalnog parka Sjeverni Velebit, izvješće, SO HPD Željezničar, 51 str. Kuhta, M. & Bakšić, D., (2001): Karstification Dynamics and Development of the Deep Caves on the North Velebit Mt. – Croatia. 13th Internatinal Congress of Speleology, 1-4, Brazil. Malenica, M.; Čukušić, A.; Lacković, D.; Stroj, A.; Paar, D. (2010): Speleological explorations and geomorphological properties of deep pits in Croatia // 18th International Karstological School "Classical Karst" - Dinaric Karst / Mihevc, A. ; Prelovšek, M. ; Zupan Hajna, N. (ur.). Postojna : Karst Research Institute, Scientific Research Centre of the Slovenian Academy of Sciences and Arts, 39. Paar, D., Ujević, M, Bakšić, D., Lacković, D., Čop, A., Radolić, V. (2008): Physical and Chemical Research in Velebita pit (Croatia). Acta carsologica. 37, 2-3; 273-278. Paar, D., Radolić, V., Lacković, D.; Buzjak, N., Čop, A.,; Bakšić, D. (2009): Radon concentration measurements on Mt.Velebit and Mt.Žumberak (Croatia). 17th International Karstological School "Classical Karst". Gabrovšek, F. ; Mihevc, A. (ur.). Postojna : IZRK ZRC SAZU, 78-78. Paar, D.; Bakšić, D.; Radolić, V.; Lacković, D.; Ujević, M. (2010): Deep pit in Dinaric karst as underground laboratory // 18th International Karstological School "Classical Karst" - Dinaric Karst / Mihevc, A. ; Prelovšek, M. ; Zupan Hajna, N. (ur.). Postojna : Karst Research Institute, Scientific Research Centre of the Slovenian Academy of Sciences and Arts, 49. Ujević, M., Paar, D., Bakšić, D. (2007-2010): Analiza vode u dubokim jamama u Hrvatskoj, biti će publicirano.